Most people probably felt it at one time or another. A lump in the back of the throat that doesn't go away when they swallow or clear their throat and sometimes comes with a stuffy nose or an itchy throat. 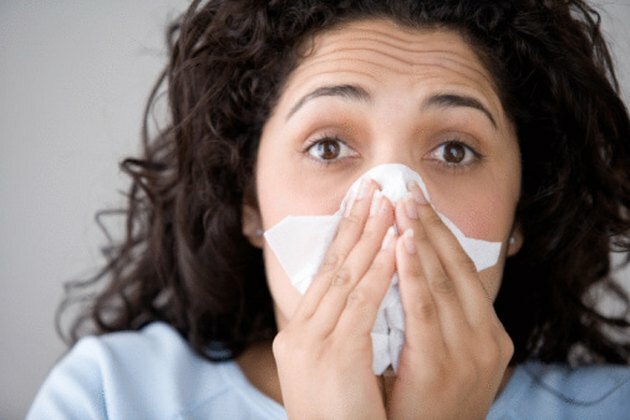 Post nasal drip is a common symptom of a cold or allergies that occurs when the nasal membranes become obstructed. This obstruction causes the mucus to drain down to the throat instead of going through the nose, where it can be extracted by blowing your nose. Although it's not life-threatening, it is often annoying and can cause a sinus infection if not treated over a period of time. There are a number of over-the-counter medications available to relieve post nasal drip. The most common decongestant is pseudoephedrine. Sudafed, Actifed and Comtrex all contain pseudoephedrine. Oral decongestants reduce the swelling and inflammation of the nasal passages and help to relieve the obstruction that is causing the post nasal drip. Histamines are natural chemicals released by the body when after coming into contact with an allergen. The reaction that occurs can cause post nasal drip. Antihistamines work to stop the reaction and reduce congestion. Decongestant nasal sprays are applied directly to the nasal passages through a bulb-tip applicator. One of the most common nasal spray decongestants is Oxymetazoline (commercially sold as Afrin) or a saline spray. The sprays shrink the blood vessels in the nasal passages to improve breathing and promote drainage. Nasal lavage is the process of naturally draining the nasal passages. The most common form of nasal lavage is utilizing the neti pot. Water is passed through each nostril with the bulb-tip of a pot. The tip is inserted into the nostril on one side as you tip your head, water drains out of the other side. Nasal lavage dilutes mucus or forces it out of the nasal passages. Blowing your nose afterwards can remove any extra water or mucus. Mucus thinning agents, such as Mucinex, contain agents that thin the mucus and prevent pooling at the back of the nose and throat to help you clear your throat and nasal passages. Drinking ample fluids, primarily water, can help to thin mucus and help a mucus-thinning agent to work in a more efficient manner.